Thank you to the members for your patience this week whilst the greens staff carry out essential course maintenance ahead of the playing season. We are currently witnessing a very difficult period with the soft ground conditions causing problems accessing various parts of the course to carry out work. Thanks again for your understanding and fingers crossed the sun keeps shining! It has been great to see the nights staying a little lighter and some of you coming down to the club for a few holes after work. Pop by the pro shop and say hello before you play, it would great to catch up with you after a long winter. Motocaddy S1 and M1 lithium trollies now in store. 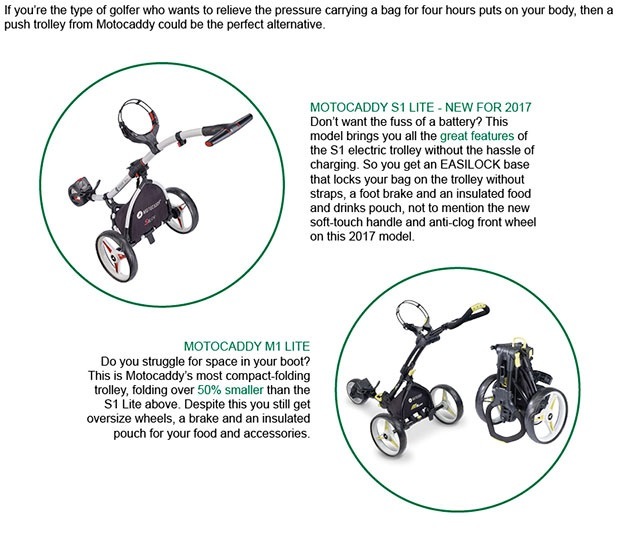 Buy any Motocaddy Electric trolley and bag combination and you will get a FREE accessory station. Also, don't forget you also get up to £20 OFF the bag if you trade in your old one. The M1 pro can fit into the smallest of car boots so if you need a space saving trolley this is the one for you! Pop in to see one of the team for a demonstration, we will even take the trolley to your car and see how it fits for size. How do I know if I should get fitted for my wedges? Click here to see the Analyzer in action. 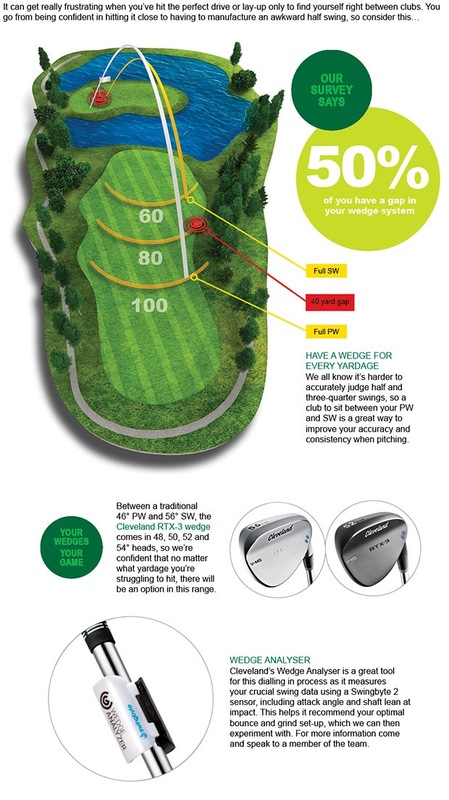 We are approved Cleveland wedge fitters so take advantage of our FREE Custom Fitting Service and find your ideal wedges. Following last week's piece in my newsletter about the newly have installed grip section in the pro shop, we have had loads of interest in new grips ahead of the playing season. Bring your clubs in to the pro shop and we will check them for you. Do you think your irons don't sit properly at address? Then you may well benefit from one of our most popular services. We will Loft and Lie check your irons for FREE. A 20 minute check-up will tell us all we need to know and then we can use this machine to make any adjustments that are required. Our professional staff have been busy again this week helping you improve your golf. 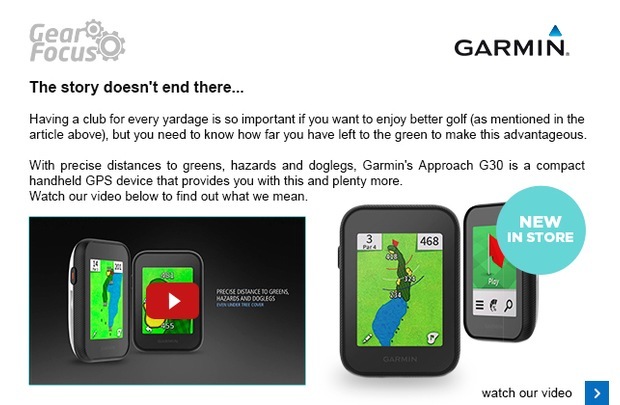 As your professionals, we care and take pride on helping our members play better golf. Our passion lies in helping you! Don't forget, we have video swing analysis and launch monitor technology to give valuable data about your swing and any adjustments required. We even offer members a FREE 15 minute check up with Golf Guru Gary so book yours now. This is repeated as a number of members suggested it was not clear as to which competitor I was referring too. Made by a member of staff from American Golf Discount Preston. On the down side, it was a PGC member asking American Golf Preston to match my price and then bought them from the high street! 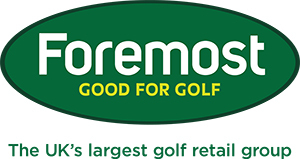 Please remember, we are as competitive on price as the internet and high street stores whilst offering you the best professional advice and service to suit you and your golf.